At this step, specify the manner in which you want your passwords to be restored. When providing a new password for the account that is being restored, check that it complies with the password policy in your production environment. 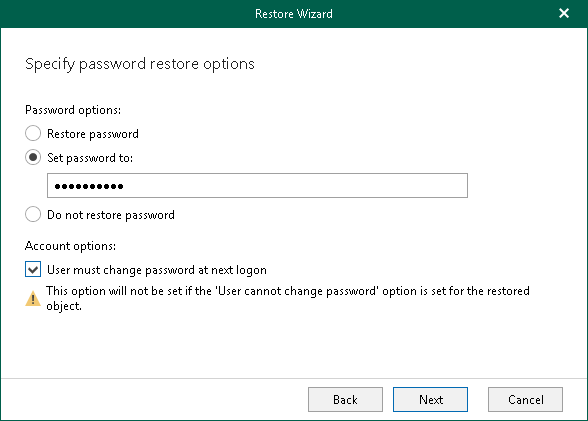 If you select Restore password or Set password to options, you may also request a user to change the password at next log on. Mind that this setting will not take effect if a user is not allowed to change the password due to security limitations. When restoring multiple accounts, a new password will be set for all the accounts altogether. To restore account passwords, Veeam Explorer for Microsoft Active Directory uses registry database. Make sure that the System registry hive is available. The default location is %systemroot%\System32\Config. When restoring Active Directory database from an Active Directory backup file using Veeam file-level restore, the registry hive will be located automatically. Otherwise, make sure the system registry hive is located in the same folder as .DIT file.